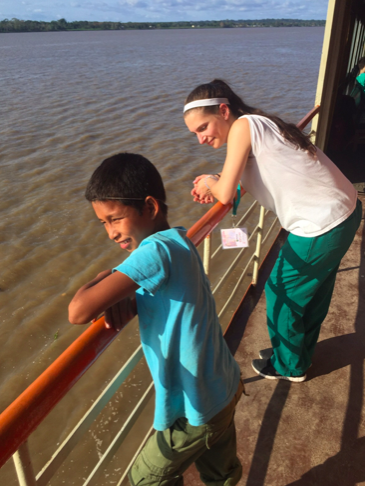 Today was our 2nd day seeing patients on the Amazon Queen. We rode down the amazon and stopped at a village along the way where the people of that village were patiently waiting for our arrival. As soon as we arrived we all noticed that a great deal of our patients were going to be children. I was assigned to pediatrics and was helping with the pediatric research as well this day so I was excited to see all the kids coming aboard. For majority of the time I was helping out with the research portion of pediatrics and was getting height, weight, arm and waist circumference data collected from the children. Many of them found the scale and tool we were using to measure height to be rather entertaining. The families all seemed very grateful even for us to simply weigh and measure their children before they were seen by the doctors. One of the boys on the boat who was on the level below kept peaking his head out of the window and watching as I measured the other kids only to disappear as soon as he saw I noticed. He eventually came up on our level where we were doing the research and stood next to me mimicking what I was doing, looking out and admiring the Amazon river. Though he didn’t say much his laugh and presence was adorable. When we were finished with clinic for that day he got on a small boat with about twenty other children and adults and rode away waving to me until he was out of sight. Though we had previously been in the clinic which was a humbling experience this was a different type of experience that allowed us to see first hand where the people we were treating lived day in and day out. They welcomed us with open arms into their village after we completed clinic and we played soccer and volleyball with the children and even parents of the children. Treating these people was not only rewarding but interacting with them, playing volleyball, and being welcomed in their homes was even more rewarding. Though our lives and lifestyles seemed so different when we arrived to their village by the time we left it felt like our similarities were much greater than our differences and the memories gained are indescribable.